Jobless Joe Chamberlain has few skills, a broken car, and dreams of leaving his hometown of York Hills, a dying one-industry town. Meeting a strange man, he strikes a deal that will allow him to put York Hills on the map again. But is this a deal with the devil? The best part of this story is the setup of Joe Chamberlain’s life and the small town of York Hills. It is a wonderful bit of exposition that is necessary if the story is to continue and matter in future issues. I like Joe’s sister a lot. It is a story that could have progressed without the fantastic elements but when they come, they take over the narrative and threaten to take the comic into super heroics. 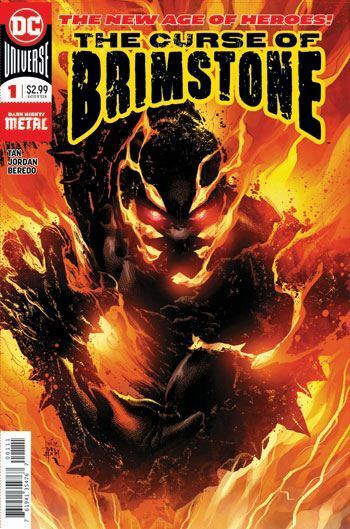 It is at this point where it is impossible to say exactly who Brimstone is? Is he Spider-man; Invincible, Johnny Storm, the Human Torch; the Ray; Damage? We do not know yet as he appears to be all of them at once without forging ahead with a new mode of being a super hero. This is something to be explored in the next issue but also the place where the comic can falter if it does not define its main protagonist further. I was more convinced with the first part of the narrative than the second one. Philip Tan is the right choice for this comic because he is one of its creators. While I would not have liked his work elsewhere, this one, he moulds into a mess that is pleasant and suits his strengths as an illustrator. But many accolades must be given to colourist Rain Beredo without whom, this comic would not have looked as great.